...A Mage who actually does what a Mage is supposed to do: cast spells. In Tomb of Ice of Descent 1st Edition, there was a mechanic I liked a lot: feats. Each time the heroes found a Treasure, they would draw a feat, a card they kept hidden from the OL that could mess with his plans. The most powerful one was the feat that countered an OL card. A spellcaster would need a deck of spells. But he should have access only to very few spells that are not very powerful at the beginning; the most powerful spells should cost the most XP. And once a spell has been cast, it should be gone for the rest of the encounter (or at least until the whole deck is reshuffled), like in the Advanced Dungeons & Dragons of old. 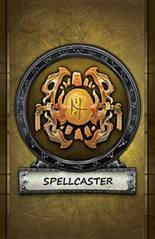 It would be something like: the Spellcaster class. 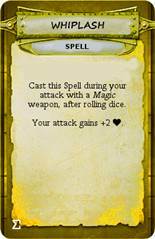 In addition to his skill cards, he has a deck of Spells that he is able to build during the course of the campaign by spending his XP. Whenever he draws one, he keeps it hidden from all players until he plays it. He may talk about it, but if he does, the OL can listen. The Spellcaster needs line of sight to his target to cast a Spell on it. When cast, a Spell is discarded and gone for the rest of the Encounter. If there are no Spells left in the Deck, no new Spell can be drawn. 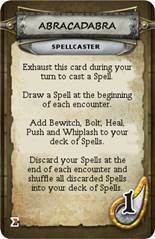 The discarded Spells are reshuffled in the deck of Spells at the end of each Encounter. 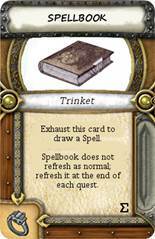 Trinket: Spellbook – exhaust: Draw a Spell. Spellbook does not refresh as normal; refresh Spellbook at the end of each quest. Starting skill: Abracadabra. Draw a Spell at the beginning of each encounter. Add Heal, Protect, Teleport and Whiplash to your deck of Spells. Discard all your Spells at the end of each encounter. Pay 1 fatigue, exhaust: Cast a spell. 1XP: Inflame. Draw a Spell at the beginning of each encounter. Add Fireball to your deck of Spells. Abracadabra does not exhaust. 1XP: Exorcism. Draw a Spell at the beginning of each encounter. Add Exorcize to your deck of Spells. Abracadabra’s fatigue cost is reduced by one. 1XP: Mnemonics. Draw a Spell at the beginning of each encounter. Add Replay to your deck of Spells. Abracadabra may be played during other players’ turns. 2XP: Handiwork. Draw a spell whenever you draw a search card. Add Repair to your deck of Spells. 2XP: Warlord. 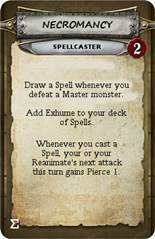 Draw a Spell whenever you defeat a master monster. Add Obliterate to your deck of Spells. 2XP: Defeatist. Draw a Spell whenever a hero is knocked out. Add Revival to your deck of Spells. 3XP: Premonition. Draw a Spell at the beginning of each quest. You may keep one additional Spell between encounters and quests. Gain +2 health. Add Negate to your deck of Spells. 3XP: Pyrotechnics. Draw a Spell at the beginning of each quest. You may keep one additional Spell between encounters and quests. Add Firestorm to your deck of Spells. Heal: A non-knocked-out hero in your line of sight recovers 3 health. Protect: A hero in your line of sight may reroll his defense dice. Whether he does or not, add 1 shield to the results. Teleport: Move a hero in your line of sight 2 spaces. Whiplash: Cast during your attack, after rolling dice. Your attack gains +2 damage. Fireball: A monster in your line of sight suffers 3 health. Exorcize: A hero in your line of sight discards a condition. Replay: A hero in your line of sight may reroll an attribute test; subtract 1 from that new roll. Repair: Flip a search card you carry face up. Obliterate: A small minion monster in your line of sight is defeated. Revival: Revive a hero in your line of sight. That hero recovers 1 additional fatigue. 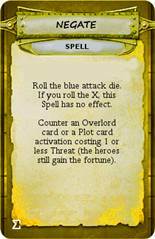 Negate: Counter an Overlord card or a Plot card activation costing 1 or less Threat (the heroes still gain the Fortune); they have no effect. Firestorm: Monsters in your line of sight collectively suffer 8 health in total, distributed as you wish. Spellcaster is just an untested idea, but I would love to see something like that: a Mage class with a deck of spell cards. Neat idea but it contradicts the lore of the world of Terrinoth. 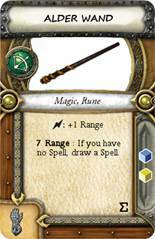 Basically almost all magic is too much for people to contain, so they store it in runes or other magical objects and draw from them. Thus why every spellcaster needs to have a magic object to work any magic. I've only really played Runebound and Descent, but I remember that being a reason given in RB 1st edition somewhere. Edit: Did some more digging and it looks like non-rune magic is beginning to be practiced in the lore setting judging from units in Runewars. So not sure why it's been rune magic until this point. FFG is extremely vague on the lore of the setting they use. Neat idea, but in order to make this new class actually "new", the spells should be more creative and fanciful. None of his spells should be direct damage/armor effects. Any direct dmg spell, such as Fireball (complete with Blast and Burn), should have an element of unpredictability, for example the wizard must roll for max range, and if he gets an X that means spell blows up in his face. What kind of creative spells? 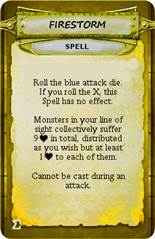 For example, maybe a spell that switches the location of a monster (in LOS) and a hero. I think that would be a 3XP Spell because it would allow heroes to win many quests where they have to catch up with a Lieutenant (The Masquerade Ball, The Ritual of Shadow, encounter 1 of The Price of Power...). I agree that the Spells are not especially original, although there are a couple of them, like Repair or maybe Negate; it was mostly to showcase the concept. Also, having one idea of original Spell is not especially difficult, but having 12 that show a sense of progression (like with 1XP Fireball < 2XP Obliterate < 3XP Firestorm) is quite another matter. Its not that bard to come up with a suite of non-ATK spells because u have many examples to glea from, for example AD&D. Another example is petrify, which turns a monster to stone for a few turns. Not allowed to insta-kill the monster, but it cramps the OL's plans because he's not allowex to reinforce the monster either. Red monster has a saving throw chance, maybe. But, a class that would revolve around the ability to mess with OL monsters like the Hexer, but with a more classic wizard feel is something not present in Descent and easy to implement. Honsetly, Im gonna input what ive been thinking everytime I see this post. Jeremy Petter. Pay attention to him and his Magic Deck. We are playtesting it in a Heirs of Blood campaign, as Challara. My players agree it is fun to play, even though they think he is a little weak, at least at the start (they lost the first 2 quests). Spells itself : since they neither cost any action nor any fatigue !!! (with that one buyable skill) its maybe too powerful in later quests, where you start with over 4 spells....guess i would go for all 1XP cards+ handwork+defeatism ...i am granted quite some nice free actions that way...possibly 1 revive+1 search action+ one teleport etc. that said i guess i would head for trenloe the strong as steelcaster / spellcaster since there is no fatigue needed....and with that skill that gives him 1 MP for casting spells...and maybe elven boots he may get along regarding speed+ useage of fatigue which he doesnt need otherwise. furthermore he has always +1 dmg and +1 shield. i would skip the role of a rogue then since trenloe will get spells by drawing search cards. And to flip a search card face up again is already a nice thing for the final. Due to his tough character he wont be targeted much i guess..he walks around tries to attack sometimes and recover fatigue that way to walk further, and grabs the search tokens to get further spells and supports with all his spells whenever it is necessary or useful. he wont be able to buy the 3XP cards but i wouldnt go for them anyway, since its A not safe to count on getting them in some cases and B they can only be played once per encounter with your current ruling -> so to withstand one OL-card / plot card effect per encounter for 3 XP with a probability of around 84% seems not worth the effort for me. Same goes for firestorm, though the extra 2 dmg each time could be very nice....but...still i would rather go for a more versatile supporter, who can get a lot out of his pocket for free while beeing tough and strong -> since i get spells for each search token i can easily swap weapons and i am not dependant on the starting weapon. this woud be my playstyle with that deck with respect to the your ruling so far. I think that way the hero group can skip the role of a rogue and go for a bit more aggressive and fast healer, who can also head for obejctives...and the last spot i would give to another Mage i guess. This group could get out a lot of dmg i think and the OL hast to be very careful all the time, since trenloe the tough supporter has quite some tricks up his sleeve ! Yes, the Alder Wand is a weak weapon that is supposed to be quickly replaced, like most starting weapons. 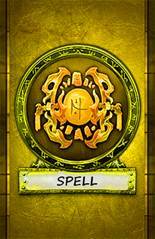 Then the 2XP skills take over for drawing Spells. Indeed, the Spellbook is often better used in the last encounter, but when you might win the 1st encounter with the right Spell... Especially if that win is important... You have the option to use it in the first. The free actions granted by the Spells in the later stages of the campaign are indeed nice, but they don't seem overpowered to me because they are not repeatable: once a Spell is cast, it is gone. A Runemaster can blast and add surges every turn, the Necromancer has Army of Death, the Hexer Plague Cloud... To me, the Spellcaster seems to have less raw power but more unpredictability. I wanted a class that could mess with the OL's plans - surprise him, even - without being too powerful. yeh, i guess you are right...after i wrote this and when i tried to figure out how i would play that class, i realized that it can be both very weak, or very strong..depending on the situation! Sure, I will report how it played out. However we don't play often (we play Descent since 2009, but our campaigns usually take over 1 year) so it will take some time. Our next session is scheduled for February. The heroes are Karnon as Champion, Ronan as Shadow Walker, Andira as Disciple and Challara as Spellcaster. As Overlord, I chose Basic 1 and the Splig agent. We play with the homerule that I cannot choose the same open group twice in the same Act, with one "magic token" for one exception once. Acolyte of Saradyn was close. The heroes advanced from both sides so I sandwiched my Goblins between Barghests to protect them. A Tripwire against Karnon missed and at the end of the heroes' second turn, I had only my master Barghest and a minion with 1 health left! But I had drawn my two Frenzies, and since most of my Goblins were still alive, I attacked the heroes' weaker side (Ronan and Challara) which also happened to be closer to the Caravan site. With good rolls, I managed to KO them both! After that, I managed to accelerate the game by keeping Goblins on the Caravan tile for one turn while running away with my remaining Barghests. On top of that, the heroes were unlucky with their search cards: they got four 25-gold potions. Siege of Skytower however was a cakewalk for me: I won on round 5. With the H&M monsters and 5 reinforced monsters per round(! ), it seems very difficult for the heroes to me. The heroes missed 2 search tokens, but got the secret room card A Place of Peace, which they wisely kept for later use. I had one funny clash with the Spellcaster when she cast Heal to save Karnon from getting KO'd by a lethal attack, only for me to play Dark Might + Critical Blow in response to add the 3 damage she was healing. The first two skills bought by Challara were Lucky, then Inflame. How about a Summoner with multiple Familiar choices? We played The Baron Returns last week-end. In the first encounter, the Spellcaster shone: first she Bewitched (stunned) Eliza while she was on her way to the middle room, then Pushed Ronan the 2 spaces he needed to get 2 vials in the same turn and end the encounter in the heroes' 4th round. The encounter started in the almost worst possible way for me: the heroes found the treasure chest on their 1st search and got the Magic Staff to replace Challara's weakish Alder Wand. But I had luck too: in the 2nd round, my enthralled Goblins were able to grab 2 vials at their first try. However, that's all the luck I would get for this encounter. In my 2nd round, while Eliza made a double move towards the next vial, she got stunned. In my 3rd round, the attacks of my Skeleton Archers (mainly chosen to negate Andira's hero ability) got Challara down to 2 health but couldn't finish her. Then, I discarded Eliza's stun and tested. A miss, but by rerolling 1 die I had a 66% chance of success. Dark Fortune - miss. Use of the Staff of Shadows - miss again! I banged my head on the table and, wiping some blood off my nose, gave the heroes their turn. The heroes already had one vial. Andira got a second plus a stamina potion from a free search courtesy of Pico. There were only 2 vials remaining, but I had a door and a wall of 2 monsters protecting them, and Pit Trap in hand. I felt confident I would get at least a 3rd vial next round and KO one or two heroes for a couple more cards. Karnon opened the door and broke the monster wall open. Challara moved, then fatigued (not completely) to get close to a vial - Pit Trap, stunned! 2 vials remaining and only one hero left to play, almost fully fatigued and too far away to get both, even with the stamina potion. Then Challara asks, "What if you were pushed a little?" It turned out that Ronan needed exactly 7 points of movement to get close to both vials. With 1 from his last available stamina, 5 from the potion (gotten with his heroic feat) and 2 from Challara's Push Spell (which she was able to cast during Ronan's turn because she had learned Lucky), he even had one to spare. He succeeded both tests (4 willpower) and I was left entering the 2nd encounter with 2 vials to 4 and only 4 cards in hand! Yes indeed, thank you. Unfortunately, I noticed your fine work a few weeks too late: I had already finished the cards and the print layout, and printed out all the Spellcaster's cards for me and my friends. I might redo them with the right templates sometime in the future though. let me see. I will try to use my templates and put together a version myself from your ideas. I am thinking of retheming it to the Novice Wizard of Greyhaven (from Runewars) and Runeshard magic, this seems kinda fitting lorewise. Here is my first take on the concept. any comments ispher on this 6 hours of work ;P ? I didn't want to sound too harsh, so I thought it wiser to take a little more time to think about the upsides. My biggest critic is about the overinflated drawing capabilities. With only one single XP (Runic Repetition), the Novice Wizard is able to cast one runeshard per turn every turn for the first 10 turns of a quest, and forever when he gets Fast Learner for another XP. Instead of slowly using up his hand, he even makes it grow with Cure, since he would draw 2 runeshards with it. This gets enhanced with the many other drawing skills like Inflame Shards, with which you can draw half of your deck at once if you wield a blast weapon or if you have a heroic feat like Leoric's. As soon as the Novice has 2 or 3 XP, his hand of runeshards will grow fast as play goes on instead of diminishing. That's not what a spellcaster (Mage or Priest) in AD&D was. The consequence of this is that runeshards will start getting cast as much as possible with little tactical reflexion instead of having their use carefully planned if they were unique and irreplaceable. "Nobody is hurt but I'll cast this Cure anyway since I'll draw 2 cards with it" or "I'll cast Bolt on my attack even though the monster is dying anyway because I need to find a Fireball that will be more useful next turn" will become "good" reasons to cast. Another thing I don't like (and which I avoided with the Spellcaster) is that Spells get discarded and reshuffled only at the end of each quest, not encounter. This favours the hoarding of a large amount of cards (or the best ones) for encounter 2. There even is the theoretical possibility that the Novice Wizard gets his whole deck in hand for the 2nd encounter. I don't like that the OL is able to do it (when he does, he usually wins too easily) and I wouldn't like it for a hero either. 1) Unlike my Spellcaster class, the casting of runeshards is limited by fatigue and by exhausting the skills, so in itself, I don't think the Novice Wizard is overpowered; after all, playing one runeshard every turn might not be more powerful than putting in play one familiar every turn. 2) It should be fun to play. Who doesn't like playing and drawing cards, lots of cards? The OL does have a full hand? Don't be afraid, fellow heroes, 'cause I do too! 3) If it's fun to play and not overpowered, what's the problem? It could be just me who has a preconception about excessive card drawing (it was broken in Magic, so... I don't like it when it seems too much). And as an OL I might be afraid that I would get annoyed at being permanently thwarted. 4) The cards are aesthetically perfect. Much better than my amateur's work. 1) I had the complete opposite feeling, that your abilities simply draw too much cards and I had to tune it down and make it more strategic and depending on exhausting and fatigue but offering some interesting twists on the concepts, maybe some cards need a downside ..? 1a) I added the draw a card on cure because otherwise with 0 exp you only get 1 card per encounter and would only draw new cards when spending 2 surges, this seemed a bit too few, also I tuned the weapon strenght down, so you had to rely on the runeshards to get things done. Also I added the "you cannot equip runes" to force a focus on the magic staffs. 2) Inflame Shards would only draw one card independent how many monsters you would kill with an attack (in the current wording), maybe it was a bit unclear and I should refine the wording a bit more? Maybe to Whenever you defeat any number of monsters with an attack..? 3) the runeshards are pretty situnational and you can only cast 1 during your turn (due to exhaust) and one extra with interrupt card per hero round, thatswhy I also modified the spellbock to discard and draw to allow to sift to better cards. I am pretty open to changing the cards to your suggestions as they are still modeled after your ideas, so if you want specific cards modified just give me a list, I just used the ideas that came to my mind and express them through your concept.